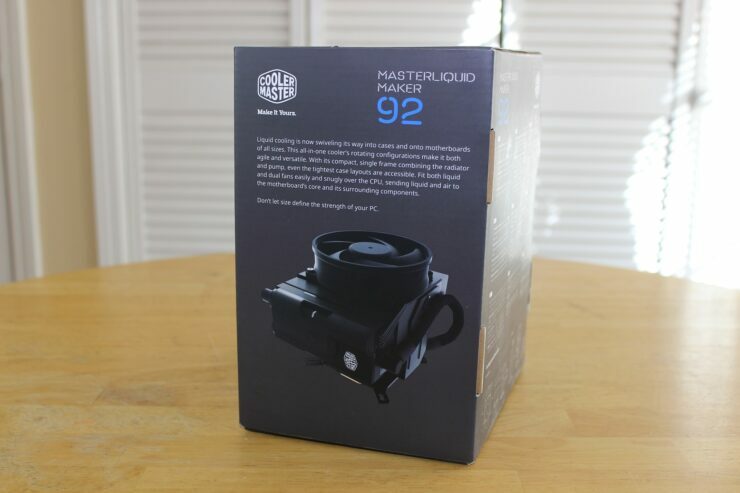 The Cooler Master Masterliquid Maker 92 is more than a mouthful of words, it is a very interesting and unique cooling solution. A quick glance at the Maker 92 would have most people scratching their heads wondering just what in the world is going on here and why would anyone bother. And then become really curious about why this bizarre amalgam carries a MSRP of $99. To be perfectly honest, if you are asking these questions then it is likely not the product you are looking for. I don’t mean that in any negative terms, but the truth is you might be better served by another cooler. But if you instead go to ‘where all can I fit this’ then it might be something you want to look into. But to get a better understanding of what is going on here let us dig in a bit deeper. 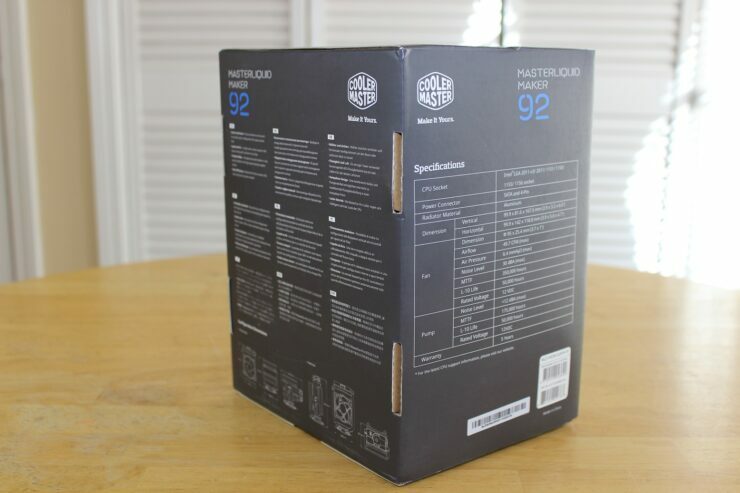 Packaging is rather straight forward, we see Cooler Masters Maker series design cues follow in this products retail package. Not a lot of fan fair going on inside with just the cooler, instructions, and mounting bracket. 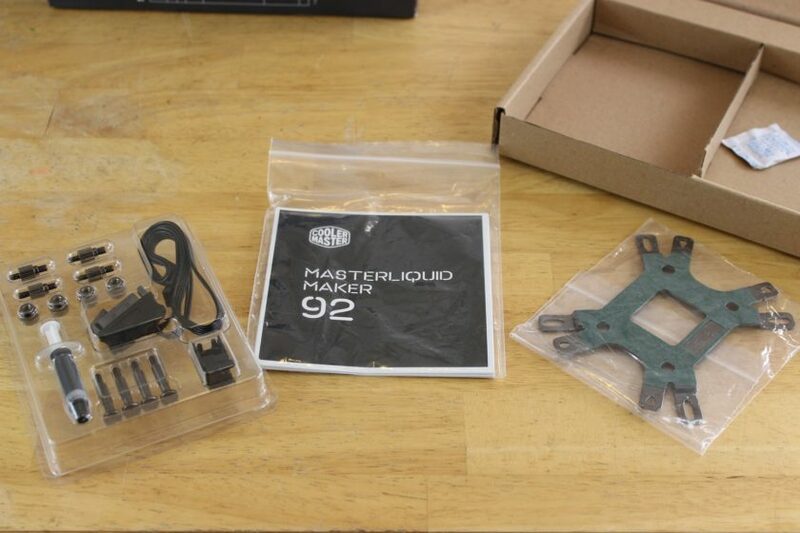 Something of note here is that the Maker 92 only supports intel mounting solutions and comes with the proper mounting supplies for socket 115x and 2011/2011-v3. Now, that’s not to say someone crafty couldn’t make it work on an AMD platform. 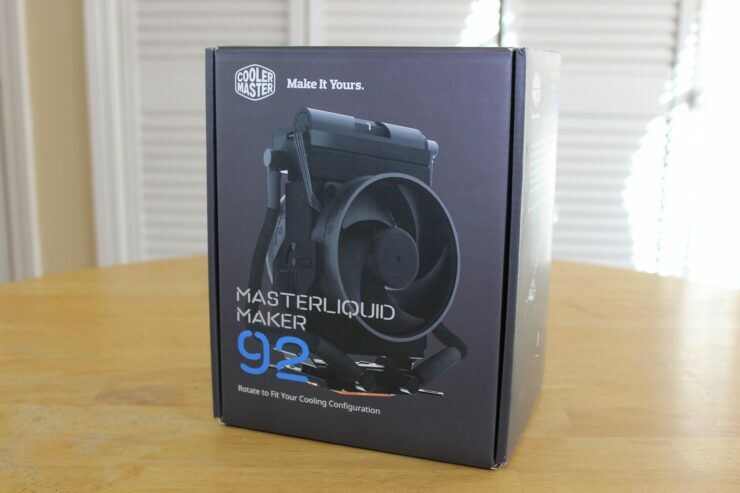 The Maker 92 also comes with CM Maker Gel TIM and a power/pwm cable for the pump. The cooler itself is where the interesting design choices come in play. What we have here is an all in one air tower rotating to downdraft cooler that simply hasn’t been done before. 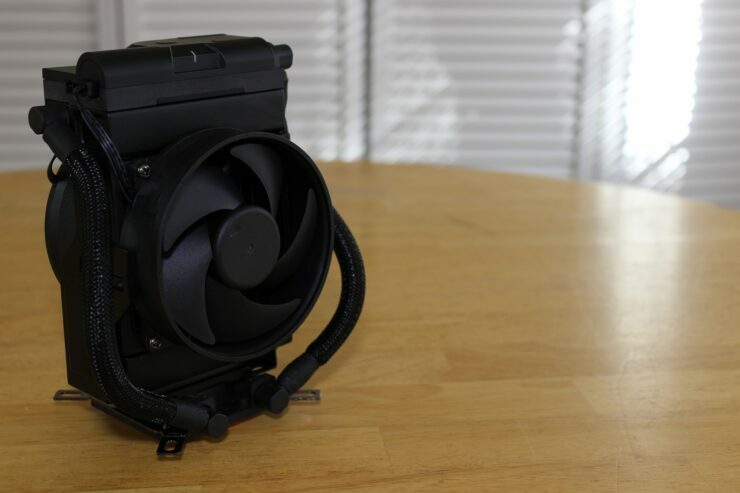 The idea here is to have a fully self contained water cooling device that can do two things, fit nearly everywhere and offer the ability to cool not only the CPU but the surrounding motherboard components by being able to be tilted in such a manner. The reason this is so important is because in many smaller form factor builds, even when a tradition AIO is used, the motherboard VRMs and Memory often get left with stagnant air and therefor running much hotter than you would really be comfortable with. 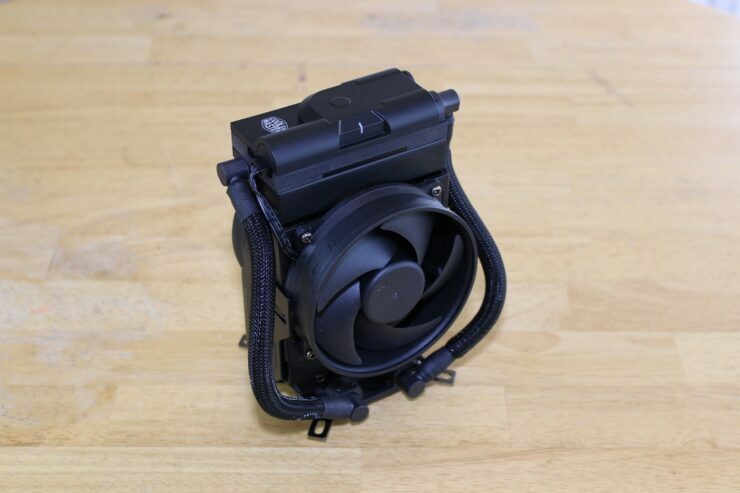 Even though the overall footprint of this cooling solution is extremely small they still managed to get two 92mm fans in a push/pull arrangement on the mounted swiveling radiator. 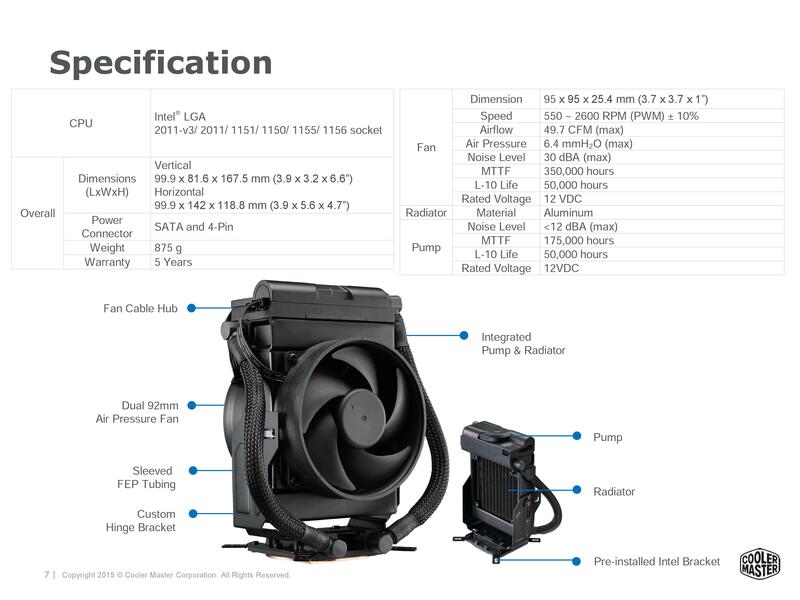 In order to minimize the height and maintain the swivel function the water pump is not mounted to or above the cold plate, but rather moved to the top of the radiator housing. A move that I very much like and wouldn’t mind seeing implemented on standard AIO coolers in the future. The only problem with that location is that when installing you will need to run the power cable to the top of the radiator and allow for enough slack if you want to rotate at times, otherwise it is a non issue. Installation was really straightforward depending on which type of Intel platform you are using. 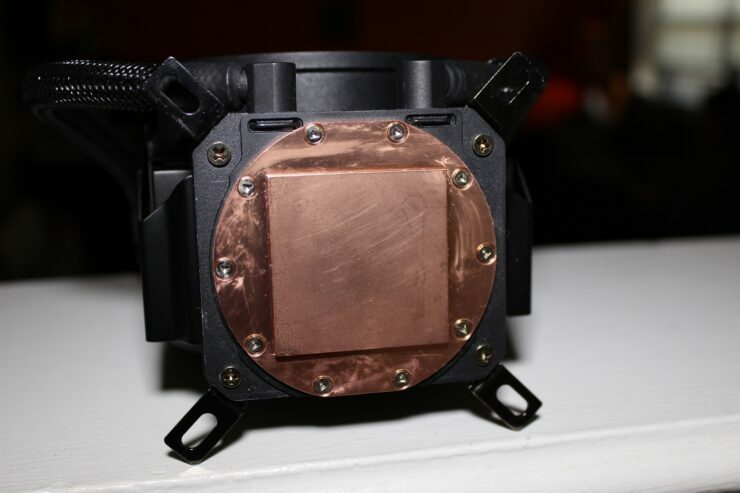 115x sockets require the backplate to be setup and installed while the socket 2011 variety only requires the standoffs to be mounted before securing the cooler to the CPU. This is much easier said than done however as two of the thumbscrews for mounting are located just under the tubing inlet and outlet on the CPU block making that part of the installation more tedious than it should be. Once the unit is mounted all that’s left is connecting the SATA and PWM cable up and you’re done. 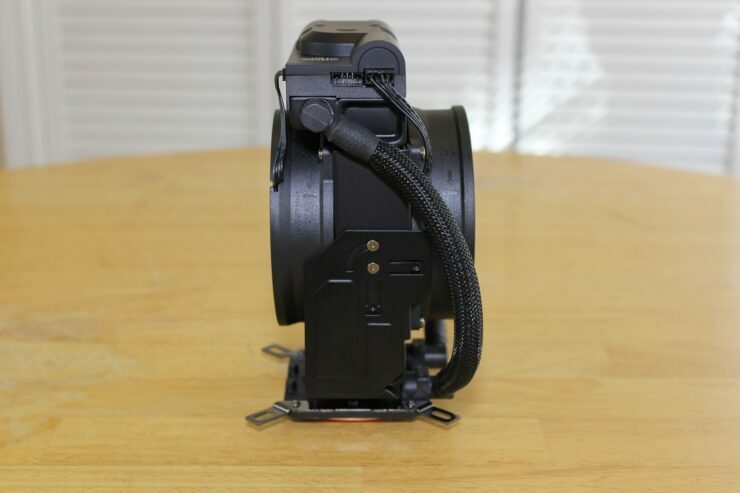 Even with the one issue with the mounting design this ends up being one of the most simple mounts ever. 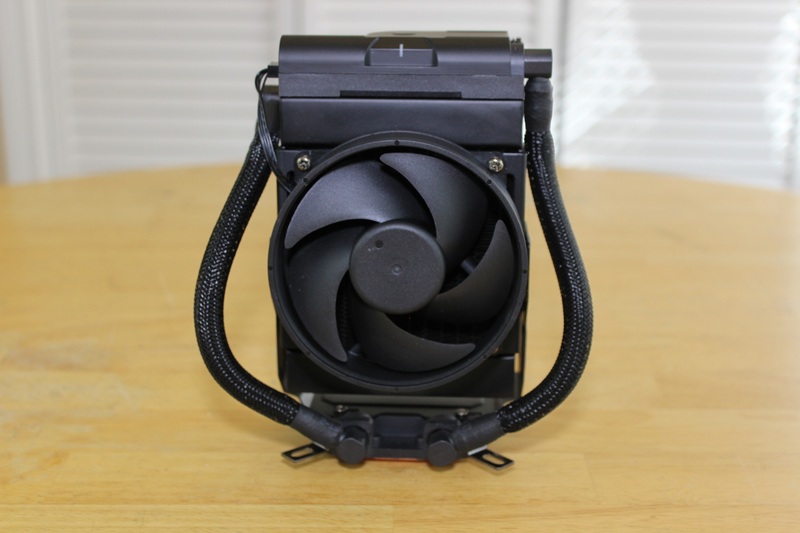 For those who have concerns with the weight of the cooler, just remember it weighs even less than the Noctua NH-D15 does without it’s fans. Testing this cooler wasn’t done in the traditional fashion. I didn’t line up several cooler and see how they performed, and I didn’t hook this up to my i7 6800k in a mid tower case. I strapped this puppy to my i5 6600k and stuffed it into my EVGA Hadron Air case. I put it in quite possibly one of the worst case conditions for a heavy overclock and in a case that simply does not support water cooling. Okay, I know if you modify the case you can get an AIO in there, but you see where I’m coming from. For comparative sake when I previously used this setup I had a Cooler Master Hyper TX3 EVO cooler and was only able to get the CPU up to 4.2GHz and hit the same temps while screaming like a banshee as I did with the Maker 92 that was modestly humming along. In this video we break things down a bit more and show you this setup running AIDA64 Extreme CPU/FPU/Cache stress tests to really put the hurt on and see how this cooler holds up. In the end I have to admit I was a bit impressed with this cooler, installation headaches aside I was pleased to see that I was now able to get a healthy overclock with adequate cooling in such a small space. I will say that while I feel the asking price of $99 is fair enough for this unique of a product, it should only be considered by those who can take advantage of if. There are a lot of great options at this price point, but nothing quite this versatile.